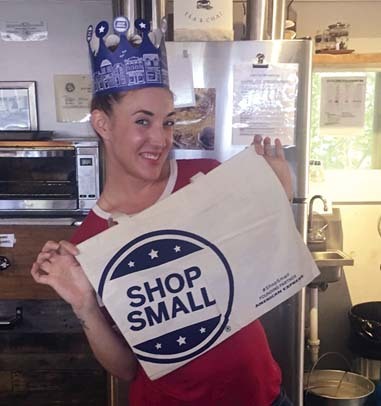 Laura Wentworth, owner of Sip Me Maui, a coffee shop in Makawao, displays some Shop Small swag recently at the shop. Small Business Saturday is a promotional effort launched by American Express in 2010. Maui businesses, with the help of Maui County’s Office of Economic Development, are making a collaborative effort to promote small businesses this holiday season, especially Nov. 26, which is designated nationally as Small Business Saturday. On that day, Sip Me Maui will be offering a half-price discount on its “Maca-Wow” latte and smoothies. While the holiday shopping frenzy usually focuses on Black Friday deals at major retailers, Maui’s small businesses and Maui County officials are making a collaborative effort this year to urge residents to also shop small. Mayor Alan Arakawa’s Office of Economic Development has launched its inaugural promotional effort to increase marketing and awareness of small businesses through Small Business Saturday on Nov. 26. Various businesses from Makawao to Wailuku are already part of the effort. Started by American Express in 2010, Small Business Saturday encourages shoppers to support small retailers during the holiday season. The credit card company and small businesses offer promotions to get customers in the doors — especially on the designated Saturday shopping day. It is estimated that each dollar spent at an independent business returns roughly three times more money to a local economy than one dollar spent at a chain store. Kapono’ai Molitau, owner of Native Intelligence in Wailuku, is participating in Small Business Saturday for the first time this year. “We are excited to be part of this program,” said Molitau, whose store offerings include locally made products including wearable art, wood, featherwork and jewelry. He will be offering up to 25 percent discounts on Made in Maui and Made in Hawaii products as part of his promotion. “I think people head to big businesses to purchase gifts because of the array of savings found in one particular place,” he said. “(But) our small business focuses on items made by our people of Hawaii, crafted by their hands, made with much aloha and attention to storied places. “We believe in quality versus quantity in what we are able to offer our loyal client base as well as our new clientele,” Molitau added. The holiday shopping attention and advertising efforts given to major retailers don’t bother her, as she thinks her business can give customers something they cannot get from larger stores. “I really do not worry about the big-box stores. Customers love our personal attention and unique mix of creative merchandise that there seems to be a little something for everyone,” Pottorff said. Her shop, which opened in 1991, offers clothing for men, women and children. She has locally made jewelry, cards and clothing, along with a few designer labels that reflect an island lifestyle. Pottorff’s employees also sell their own products in the store, including jewelry, cards, block-printed textiles, and Pottorff herself repurposes vintage fabrics into children’s clothing and accessories. “It creates a creative work environment,” she said. Biasa Rose’s sale this year will be 20 percent off all clothing and an extra 10 percent off the sale rack. “It’s (also) our 25th anniversary, this is my giving back to our loyal and fabulous customers who have supported us through the years,” Pottorff said. Nearby at Pearl Butik, there will also be refreshments and a 20 percent off storewide sale. Jasmine Bustamente, a Maui jewelry artist who has had her work featured in Sports Illustrated’s Swimsuit Issue, will be the artist in residence on Small Business Saturday. In years past, some Maui small businesses have done their own promotions. Now, the county, with the help of local company Sae Design (which is also related to Wailuku small business Maui Thing), is looking for local small businesses and independent merchants to join its Small Business Saturday effort. Business owners are urged to contact Ashley Leahey at ashley@saedesign.com for more information on the Maui County effort, and can join the national movement by registering at shopsmall.com. Shoppers wanting more information on Maui businesses participating as well as deals and Shop Small promotions, should view the Shop Small Maui page on Facebook, www.facebook.com/shopsmallmaui/?fref=ts. American Express’ Small Business Saturday promotions can be found at www.americanexpress.com.